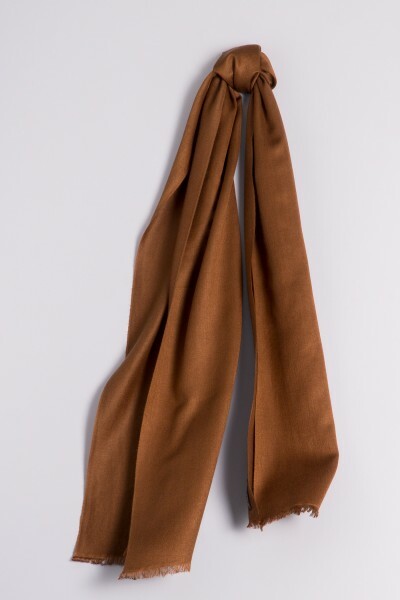 Product information "Midi Doubleface chocolate"
This classic scarf (45 × 180 cm) features many loving details. Thanks to the special weaving technique, the luxurious blend of 60% cashmere and 40% silk creates a delicate two-tone effect. One side is dominated by the elegant sheen of silk. The other features the subtle accents of the cashmere yarn. These contrasts created a slight layered effect, thereby making our Doubleface scarf a real conversation piece. The pleasing combination of high quality materials is underlined by a selected colour palette. Another fine detail is the short silky shimmering fringe. It is sure to be a favourite. Related links to "Midi Doubleface chocolate"